This marble resembles the planet, Mars. 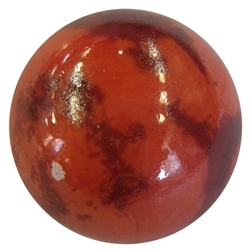 It is a solid red glass marble that is screenprinted to look like the surface patterns of the red planet. They are 1" or 25mm in diameter. Warning! : Choking Hazard. This toy is a marble. Not recommended for children under 5 years.